The pieces of this exceptional antique Victorian sterling silver flatware service for eight persons have been crafted in Rich Bead pattern*. The anterior and reverse surface of each handle is embellished with convex bead and shell decoration. The decoration to the anterior surface of each handle, excluding the knives, is ornamented with a contemporary bright cut engraved crest depicting a savage's head amidst two arms in armour gauntleted counter embowed with hands apaumé. The reverse of each spoon and fork features a convex shell to the heel. 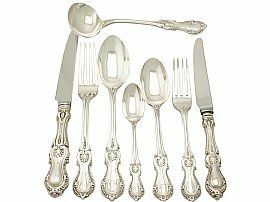 The fundamental pieces of this service have been crafted by the renowned silversmiths Elkington & Co Ltd in 1900, apart from the table and dessert knives, which are replacements***. This antique flatware service is supplied in felt cutlery rolls; which not only protect the items in storage but significantly reduces tarnishing. * Rich Bead is a late nineteeth century Elkington pattern which later appeared in other catalogues under the name 'Prince of Wales'. ** "Straight" means all the pieces are made by the same maker in the same year. *** Predominately all antique silver canteens have replacement knives as the originals have not stood the test of time. 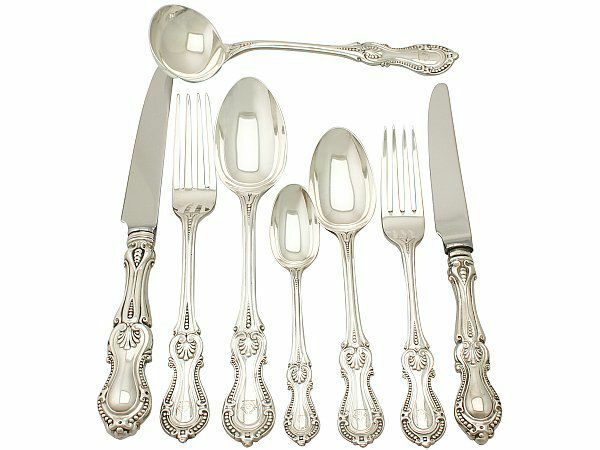 This antique flatware service is an exceptional gauge of silver, exceptional quality and in exceptional condition. Full hallmarks struck to the reverse of each item are all clear in keeping with age.